A tornado touches down near Three Hills Alberta, and a flurry of footage appears on the web. 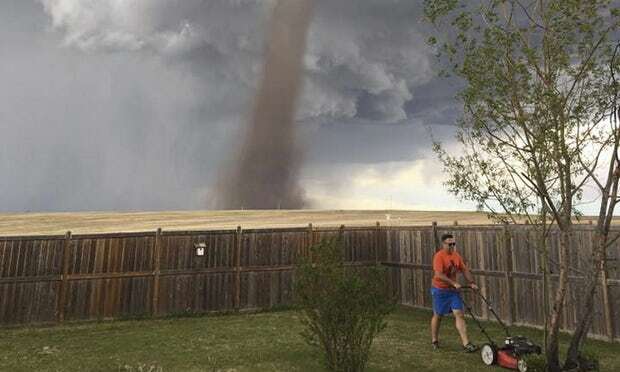 But one photo goes viral: a man nonchalantly mowing his lawn as the twister apprently bears down on him. As twisters go, this is a beauty. Few are are as photogenic as this modest-sized one, sweeping regally and predictably across the Great Plains at safe distance. This one – perhaps an EF1 or 2 on the Enhanced Fujita scale of tornado strength,with winds up to 135mph – reminds me of the Wray, Colorado twister from last year, its funnel caught perfectly by the sunset, the brown dirt swirling outside a graceful elephant trunk masking the mayhem happening at the centre of the vortex. If you want to see how close you can get to a tornado of this type check that out on YouTube (but don’t try it yourself). It is usually the aftermath of those horrible, EF4 and EF5 monster “wedges” we see on TV reports. People find themselves driving through a wall of rain and golfball-sized hail, only to emerge into an EF5 with up to 300-mph winds. That’s strong enough to toss trucks hundreds of metres and they can completely remove stone buildings from their foundations, strip roads of concrete and leave bizarre parting gifts such as pieces of straw embedded in telegraph poles or metal and chairs lodged in concrete. Clearly you don’t want to be anywhere near a tornado like that. Not that this would deter extreme chasers such as Dr Reed Timmer or filmmakerSean Casey, who have built specialy adapted armoured vehices to intercept powerful tornadoes and conduct research. Sean Casey’s TIV2 vehicle is armed with 2ft spikes that anchor the TIV into the ground like a limpet, aiming to get right insie the funnel, whichg he has done – with jawdropping results. You can see that unforgettable footage on YouTube. But ultimately, for me, the ideal tornado is Mr Wessel’s photogenic funnel snaking harmlessly over the prairie. From that distrance you can take in all the wondrous structure of the entire mesocyclone. Next Around the world in six cookbooks.